An Access Control System (ACS) manages the access in and out of a parking facility; the parker must present a valid parking credential. Revenue control involves transient and non-transient parker management and includes payment at the time of parking. Typically it refers to the servers, terminals and kiosks used for payment and gate control in a garage. A parker who pays for parking on a short term basis, typically daily or less. Transient customers typically pay for the amount of time used versus a set period of time to park (e.g. a month, a semester etc.). Non-transient parkers are people that use a permit or credential to park on an ongoing basis (e.g., monthly parker). This can be in an access controlled facility or in a surface lot with no gate. A Revenue Control System is a system for managing and auditing the payments of transient and non-transient parkers in a parking lot or – facility. Access and Revenue Control (ARC), also known as (PARC), is available in verifying levels of functionality and complexity. Access and revenue systems allow parking owners and operators to control access and collect parking revenues from users. Available in varying types of equipment platforms, ARC systems, when combined with policy and procedure, can speed entry and exit from a facility and secure revenues through audit records. A barrier or gate is the hardware used to control access to a facility or lot. Alarms are used in access and revenue control systems. These are system generated messages that indicate potential problems with equipment or operational rules that have been broken (i.e. vehicle entered lane and then blacked out). This represents multiple parking technologies beyond revenue and access control, which typically applies to off-street parking facilities. Other systems represented by CPMS include meter revenue systems, parking guidance systems, systems that track occupancy and other systems that do not necessarily include access and revenue control. A ticket validator electronically encodes validations either onto the original transient ticket or onto a separate magnetic stripe validation ticket. Encoding stations are a basic offering in PARCS. A magnetic stripe is a strip of magnetic media that is usually found on a credential such as a credit card or hotel key. A magnetic stripe can store a small amount of data. This is a hardware device that reads magnetic stripes and converts information stored there to data that can be used by a computer or controller. This is a computer with encoding software that is connected to a ticket validator. These are typically used to allow a cashier to update the magnetic stripe of a parking ticket with new information (rate, payment, etc.). This is hardware in a lane where the customer inserts a dispensed ticket showing that he paid. The hardware verifies payment and raises the gate. An exit verifier is also known as an exit station. A central cashier can be a person (cashier) or pay station. The customer takes their ticket after it is processed and inserts it into an exit verifier. A central cashier staffed by a person may also take citation payments and sell permits. The key is that it is centrally located and not typically located in a lane. This is an in-lane cashier station or booth in the entry lane to a facility that may be used to collect payment for parking; dispense token, ticket, or other item indicating time of entry or validity of vehicle; or detect permits or other permission to enter. The automated pay station allows for automated ticket processing in central cashiering facilities. It can supplement and / or replace cashiers. Sometimes these stations are called pay on foot – or pay in lane machines. The Automated Pay Station can accept multiple forms of payment and provide receipts. These are the electronics in the hardware associated with a lane. It choreographs the activity in the lane, activating and deactivating equipment based on triggers such as vehicle presence. The lane controller often sends and receives data from an online central database to allow access to the facility. Loops are sensors that are placed in the ground of a lane or level of a parking facility to detect a vehicle passing overhead. They track occupancy and enable ticket dispensers or permit readers by identifying the presence of a metal object passing over the loop. Two-loop (or three-loop) systems can provide directional logic for vehicles entering or exiting a facility. Two-loop means that two loops are laid in the ground next to each other. This system allows the user to view system-generated activity, alarms and occupancy within a facility via the Parking Access and Revenue Control System (PARCS). A Facility Management System or FMS is the computer system and software that provides real-time reporting, monitoring and controlling of the Parking Access and Revenue Control Systems (PARCS). In essence, this represents the brains of the system. 'Real-time' is an interface that updates instantly. This is a setting that requires Access Control System (ACS) users to enter and exit in proper sequence with their parking credential (i.e. entry, exit, entry, exit etc.). Anti-passback is typically selectable as 'hard' and 'soft'. Hard anti-passback setting rejects the ACS users that are out of sequence and should be set an alarm at the ACS controller and Facility Management System (FMS). In this situation an alarm means a system generated message that indicates a potential problem with equipment or operational rules that have been broken. This setting allows the out-of-sequence ACS user to enter and exit, but reports and records violations with an alarm at the FMS for follow-up by the parking manager. Soft anti-passback provides a more patron-friendly experience while monitoring for misuse. This setting should be unique for each user. In both the hard and soft mode, each out-of-sequence event is reported as an exception transaction in the daily ACS access log. Many systems have the capability to clear the anti-passback condition via a password-protected resynchronization of the user's account. This system is typically internal to a parking facility and provides guidance to open parking spaces. These systems can include dynamic signage and individual floor and space availability indicators. 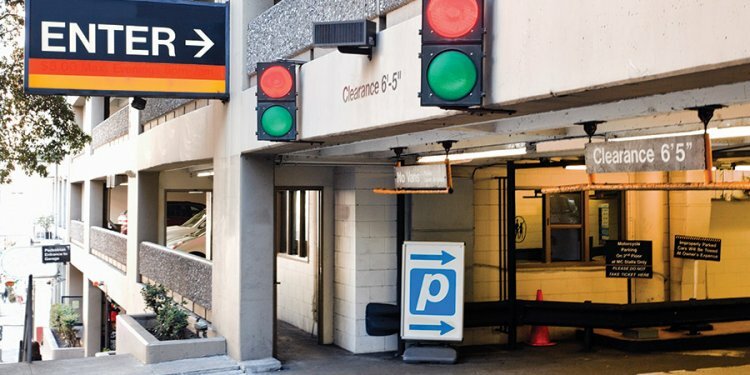 Newer generation parking guidance systems detect individual space occupancy with stall sensors and can also share information with GPS-enabled vehicles and smartphone apps, which extend them beyond a parking garage or surface lot. It can guide traffic searching for parking spaces through a city which improves the traffic flow. When detecting space occupancy, the system detects the percentage of spaces in a facility that are occupied. Rules can be set to limit the number of parked vehicles based on a schedule. Example: If a facility has a capacity of 100 spaces and 90 of them are occupied, the occupancy is 90 percent.